(1) Why is it in the revised edition of the Bhagavad-gita, you and company have completely removed the foreword by Professor Edward Dimock that was printed in the original Macmillan version of the Bhagavad-gita As It Is which Srila Prabhupada regularly read from? Readers, please visit the website and see the video on YouTube of Srila Prabhupada lecturing on the Bhagavad-gita. There, in the very immediate beginning (very first few minutes) of this video, you will find Srila Prabhupada praising the foreword by Professor Edward Dimock. This particular video clip is taken from one of the 19 Double layer DVD’s produced by Nrsimhananda Prabhu and his associates at ITV. It is the particular DVD named Bhagavad Gita as It Is, with Krishna and Arjuna on the chariot, and sky background, and is in the very first part, called “Introduction”. Srila Prabhupada in the video explains this particular statement by Edward Dimock, on how a Krsna devotee interprets his own texts, by explaining that just as a family member only is qualified to give the best knowledge to others about his own family, similarly, only a Krsna devotee can properly explain to others about Krsna. Srila Prabhupada appreciates this particular point made by Edward Dimock in the video. Below there are several instances where Prabhupada shows appreciation for the foreword by Edward Dimock. Please note that Prabhupada said that this foreword will “appeal to the scholarly class”. And we see here that Prabhupada in fact used the foreword to preach to professors, scholars, cardinals and journalists. As can be seen from the below quotes Prabhupada appreciated the foreword because it underscored some of his own points about this specific edition of the Bhagavad-gita, namely the As It Is version. But the BBT International under the leadership of Jayadvaita Swami have now removed this foreword by Professor Dimock without ever explaining why. Certainly Prabhupada never asked for its removal. Professor: Well, it is quite widely read, the Bhagavad-gita. Professor: The Bhagavad-gita is quite widely read. Pradyumna: This is an introduction by Professor Dimock. Prabhupada: Professor Dimock has said very nicely. Prabhupada: You have not brought by the fruit? Nitai: Yes, Satsvarupa Maharaja did. Monsignor Verrozano: We have here one translation of the commentary of Professor Zehner(?) from Oxford. Prabhupada: Here is my foreword by Professor Dimock. Yogesvara: This is a professor from Chicago University who wrote the foreword to this edition. He makes an interesting comment. Prabhupada: You read, read it. Cardinal Pignedoli: It’s very strange and famous. That’s the gospel. Prabhupada: Yes. That is legitimate. Prabhupada: Yes. That is his word. Prabhupada: “Somehow or other.” This is science. “Somehow or other,” “maybe,” “perhaps.” This is their science. [break] …speculation. The whole Western countries, their all knowledge simply speculation. Nothing definite. [break] …Professor Dimmock has “Definitive…” What is that translation, or something like? Prabhupada: Yes, yes, yes. You just read one big professor’s remark here. You see? Prabhupada: Professor Dimmock of Chicago University. Faill: “A new and living interpretation.” This is you, is it? 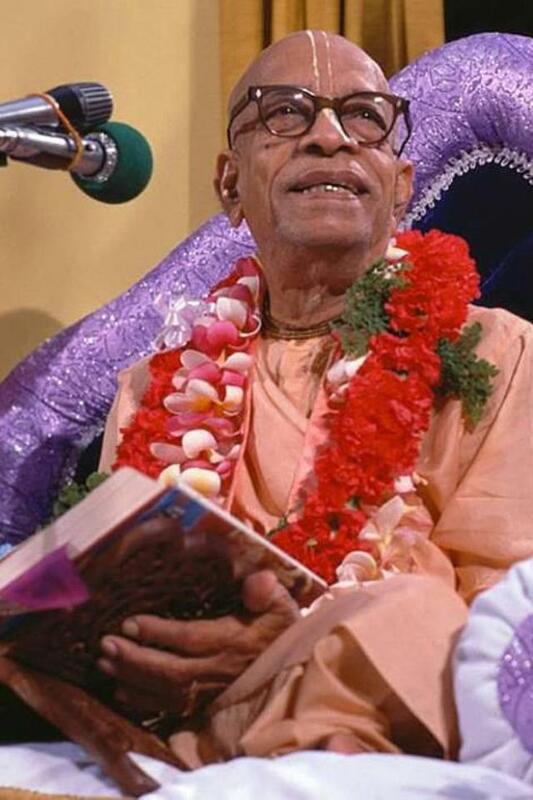 Pusta Krsna: In the United States… These are many letters we have, just some of them, from different professors who are actually using Prabhupada’s books, professors from respectable universities such as Harvard, Yale, Duke. Professor Dimmock, who is the leading scholar of southeastern languages at the University of Chicago, he very much appreciates Prabhupada’s books. Prabhupada: He has written one foreword. Pusta Krsna: So these books are being accepted as the authority, at least in America and England, so far as studies of Indian culture are concerned, philosophy, sociology. And you can see the beautiful presentation. Each Sanskrit is there, transliteration so that anyone can chant, word-for-word Sanskrit to English translation, translation in English, and then the purport, a commentary. Prof. Olivier: That’s right. This is a good edition. Good edition. Pusta Krsna: Professor Dimmock, he says that there are many, many translations of Bhagavad-gita, and he says that “By bringing us a new and living interpretation of a text already known to many, A.C. Bhaktivedanta Swami Prabhupada has increased our understanding manyfold.” So although it’s been prevalent in America… I know that when I was studying Humanities in college in the University of Florida, Bhagavad-gita was required. And we read one edition, but it was very much limited. Until we come in contact with Bhagavad-gita As It Is, the understanding is very much limited. But it’s not a sectarian approach. It’s purely scientific and realistic. There are many such reviews. Prabhupada: No, no. Who has written foreword to my Bhagavad-gita? This entry was posted in All posts, BBTI, Bhagavad-gita As It Is, Direct quotes, Dravida Dasa, Examples of changes, Jayadvaita Swami, No authorization, No reply from BBT International, Prabhupada said and tagged authorization, BBTI, Bhagavad-gita, definitive edition, Dimmock, Dimock, Dravida, examples of changes, foreword, Jayadvaita, posthumous editing, prabhupada. Bookmark the permalink. BBTI took it out in 1983. Have you not seen it in all these years?